Beef tri-tip roast and tri-tip steaks are enjoying increasing popularity and availability. But few people grew up getting served this flavorful cut of beef, so it still brings up many questions. This often overlooked cut of meat is not only relatively inexpensive but also very flavorful. It has become a favorite among those in the know. Learn where this cut came from and how best to cook it and enjoy it. The tri-tip roast or steak (also called a triangle roast) is the 1 1/2 to 2 1/2 pounds of meat that sits at the bottom of the sirloin. The name comes from the triangle shape (tri) and that it is at the tip of the sirloin (tip). For years, the beef tri-tip found itself being ground into hamburger or cut into cubes and sold as soup meat. The reason for this is that there is only one tri-tip per side of beef. In times past, butchers would carve the meat for their shop and it would be considered a waste of display space to sell one or two tri-tips by themselves. Chefs and butcher shops in California have been making tri-tip roast and steak since the 1950's. One butcher in Santa Maria, California would cook it on a rotisserie when he had plenty of hamburger already on display. It then became a local specialty. Now that when the carving is done by packers you are much more likely to find the tri-tip at your local butcher. If you don't see it, ask for it. In the past, almost all of it was shipped to California (if it wasn't ground for sirloin burger patties). With the recent interest, however, you can find this cut in many places including the large shopping club stores like Costco and Sam's Club. If you have to, try calling around. It's a great cut of meat and worth the search. 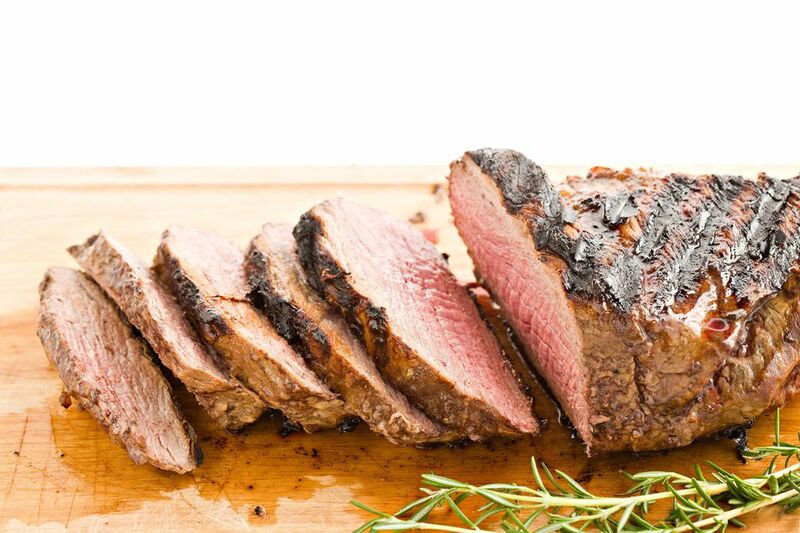 Not only does tri-tip have a rich flavor, but also tends to be lower in fat than most other cuts. Of course, this means that it can dry out faster, but with a good marinade you really can't go wrong with this cut. Good seasonings and marinades for tri-tip are those inspired by Southwestern or Asian flavors. The versatility of tri-tip is another factor that makes it great. Uncut, it is a fantastic roast that should be grilled indirectly for 30 to 40 minutes. You can also cut the tri-tip into 1-inch thick steaks that grill up in about 8 minutes over a low to medium direct heat. As always, let your steak (or roast) sit for 5 to 10 minutes before you carve or serve it. This allows the juices to redistribute and evens out the heat. Because tri-tip is lean, be careful not to overcook it, particularly when preparing the full roast. Medium is as far as you should go with this cut. Use a meat thermometer to make sure you get it right where you want it. If you are used to grilling other cuts, this one can throw some grillers off by appearing underdone when it is ready to serve.